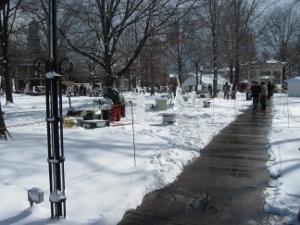 Elegant Ice Creations presents the Medina Ice Festival on Medina’s historic Public Square. February 15, 2019: speed carving at 5:30pm, 6pm, and 6:30pm; lighting of the Fire & Ice Tower at 7pm. February 16, 2019: Individual Competition from 1pm to 4pm. February 17, 2019: Team Competition from Noon to 4pm. February 18, 2019: Viewing of ice sculptures. In partnership with the City of Medina, Main Street Medina and Excalibur Auto Body.